Georges Cronsteadt has held off the youth brigade to show he’s still the stand up king of Tahiti, while Annabel Anderson once again showed her unbreakable strength as the pair claimed respective honours at the Air France Paddle Festival on the weekend. Coming into this race with a string of losses to his younger rivals over the past 12 months, Georges put in a vintage performance to out-muscle his countrymen and claim victory in a fast time of 2 hours and 5 minutes over the 24km course. Georges’ time was a minute clear of runner-up Rete Ebb, who is definitely a name to watch. 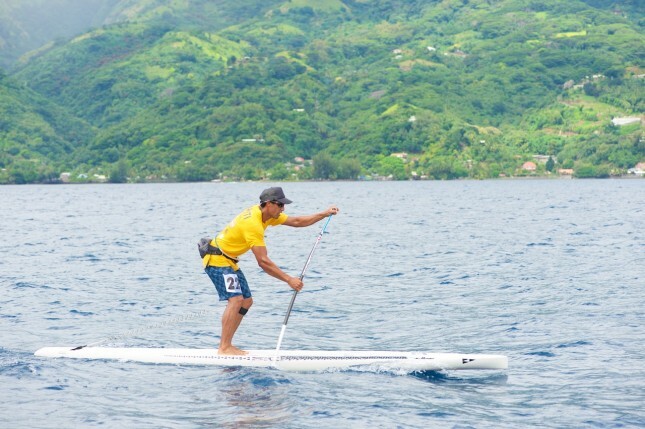 This 23-year-old is one of the strongest outrigger paddlers in a country where paddling is the national sport, and has been tinkering with SUP more and more lately. If Rete focuses on stand up paddling half as much as sit down paddling, he’ll surely become a major force in the very near future. Speaking of names to watch, our official pick to be the “World’s #1 Dark Horse” for 2015, Niuhiti Buillard, showed potential but faded to finish fourth. Niuhiti was knocked off the podium by another former outrigger champion turned SUP racer, Bruno Tauhiro. Interestingly, Bruno had competed in (and won) the 9.5km open race earlier in the day, before immediately backing up in the grueling 24km distance event. And in what was a fine day for the name Cronsteadt, Georges’ brother Yoann rounded out the top five with an impressive display. It must have been a sweet win for Georges, long the stalwart of Tahitian SUP, with the kids that have been recently nipping at his heels forced to wait a little while longer to assume the throne. The big guy looks to be in great form at the moment, though we’ll know for sure in the next few weeks: Georges will take on the world in Carolina next weekend, then again in May at the Worlds. Over in the women’s 24km event, it was Annabel Anderson all the way, with the Kiwi taking the win ahead of the highly fancied local dark horse Hinatea Bernardino. However Annabel’s win didn’t come easy: The Lahui Kai team rider was battling a serious bout of the flu in the days (and hours) leading up to the race. She considered pulling out before the race even began, but in her signature fighting spirit Annabel made it to the start line and proceeded to do what she does best: Win. Sounds like the 2015 Air France Paddle Festival was a pretty interesting race with a great turnout: Over 250 paddlers competed across the 24km, 9.5km and short course sprint races (not bad considering Tahiti’s entire population is less than that of Huntington Beach). 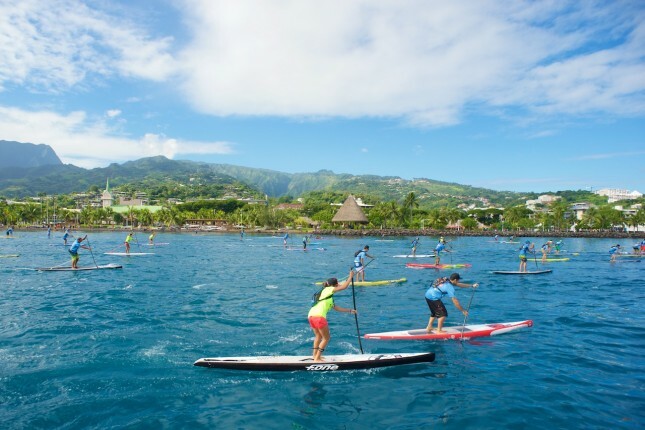 As we suggested last week, Tahiti has the paddlers, it’s just missing the events. The Air France event may just be the island’s best shot at growing an international-level race from the ground up. And after this second annual edition of the race, things are looking pretty good for 2016 and beyond. Head south of the gallery for full results.